Zinc is a metallic chemical element. In commerce, a synonym for zinc is spelter although the term generally identifies a zinc alloy or a mixture of zinc with another metal. The metal is the twenty-fourth most abundant element found in the earth's crust. Zinc has five stable isotopes. Isotopes are forms of the same element with an equal number of protons but different numbers of neutrons in their nuclei. Therefore, they differ in atomic mass but not in chemical properties. The German scientist Andreas Margraf discovered zinc as a metal in 1746. Centuries before its discovery zinc ores produced brass and zinc compounds. These compounds are medicinal agents for soothing wounds and sore eyes and remain in use today. Therefore, zinc was the eighth metal known to humans. From the period of the twelfth to the sixteenth century, India produced zinc ores and zinc oxide. The first zinc smelter opened in the United Kingdom in Bristol in 1743. Annual production of zinc exceeds eleven million tons each year. Fifty-five percent of zinc production goes into galvanizing steel as a protection against corrosion. Twelve percent goes into the production of brass and bronze. The remaining production goes to zinc-based alloys to supply the die-casting industry and rolled zinc applications, such as gutters, roofing, pipes, coinage as well as the production of zinc compounds. Most zinc mines are underground. Zinc ore must be concentrated before smelters can treat it. Concentration generally occurs at the mine site in order to keep transportation costs down. Typically, zinc concentrates contain 55% zinc with some copper, lead and iron contained. Zinc concentrates are then roasted and sintered using hydrometallurgical or pyrometallurgical techniques. The roasting process removes sulfur from the concentrates. The smelting will remove byproducts from the concentrate, which include iron, lead, silver, and some other minerals. China is the world's largest producer of zinc followed by Peru, Australia, the United States, Canada, and India. These six countries account for over seventy percent of annual global zinc production. China is the world's largest zinc consumer. China consumes 30% of annual global production, three times more than the United States- the world's second-largest consumer. Building infrastructure in China requires galvanized steel. Therefore, when the Chinese economy is growing zinc prices tend to move higher. The multi-year bull market in commodity prices that began around the turn of the new millennium took zinc prices from $1,000 per ton in 2004 to a high of over $4,000 per ton in 2007. In 2014, zinc prices have ranged between $2,000 and around $2,400 per metric ton. There is currently a deficit in the zinc market developing. This means that demand is exceeding current supplies of the commodity. Several large, aging mines will close in 2015 and miners need higher prices to justify the cost of finding and developing new sources of zinc. Miners may not be able to produce enough zinc to meet the needs of steel companies and coin makers until 2018. 97.5% of every penny made by the US mint is zinc. Meanwhile, a stronger real estate market in the US and increasing global auto sales are bolstering demand for galvanized steel. Supplies of zinc at London Metal Exchange (LME) warehouses are down 21% this year falling to three and a half year lows in July 2014. A shortfall of production could cause demand to outpace supply for the first time since 2007 when prices rose to all-time highs. Increasing demand and falling supply is generally a recipe for higher prices. Zinc is the third most actively traded non-ferrous metal on the LME behind aluminum and copper. The trading market for zinc is highly liquid meaning that it is generally easy to trade large quantities of the metal in a tight price range. 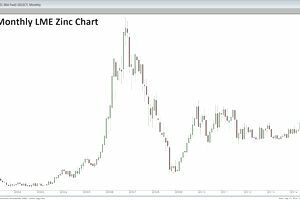 The LME offers forward and option contracts in zinc. Each standard contract represents twenty-five metric tons of LME brand-approved zinc for delivery at LME approved warehouses around the world. The LME also offers a mini-contract that represents five metric tons of zinc. Zinc is ubiquitous; we find it in steel coatings, in car tires and even in sunscreen. Zinc is a metal with many diverse uses and applications. The price of zinc on the London Metal Exchange closed on December 4 at the $1550 per ton level. This important base metal recently traded at six-year lows. The reason for weakness in zinc is the strength of the U.S. dollar and weakness in the world's largest consumer of the metal, China. With the price of zinc falling, many producers are cutting production of the metal. Nyrstar, Europe's biggest producer announced that they are halting production at three U.S. mines. This production cut at the company's underground mine in Tennessee will reduce zinc concentrate output by approximately 50,000 tons each year. In October, the struggling commodities company Glencore said that they are reducing zinc production by 500,000 tons a year and ten Chinese smelters recently said they would reduce production by the same amount in 2016. Lower commodity prices have caused production cuts when it comes to many commodities. As the bear market in raw materials continues, lower production will eventually provide support for these markets. Supply and demand fundamentals have caused prices to fall in many metal markets. As prices fall, some higher cost output becomes uneconomic. When the price of a commodity falls below production cost, output decreases. However, one of the most important costs of production is energy. As oil and natural gas prices fall so do production costs. This has resulted in the continuation of lower prices in zinc and other metal and commodity markets.